"I think this necklace is glorious. It's full of sunshine and color!" This necklace is named for Taos, New Mexico because it evokes the colors of the region and takes me back to the time I lived in New Mexico. I think this necklace is glorious. It's full of sunshine and color! "Taos Sunshine" is one-of-a-kind and features lovely Meyer Lemon-y yellow jade. 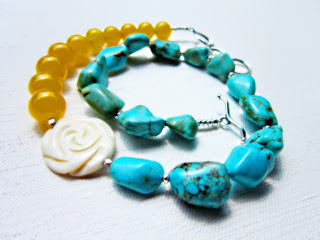 The yellow is positively gorgeous paired with the chunky blue turquoise stones. Some turquoise nuggets have a heavy matrix, others have hints of green and brown veining. Little silver beads separate each piece of turquoise, so each unique nugget stands out on its own. 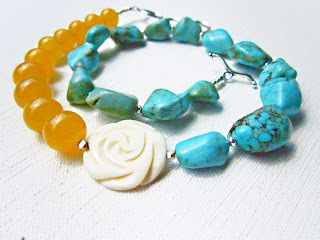 The key focal point of the necklace is the white bone pendant bead carved into a beautiful rose. Two faceted silver beads frame the flower pendant, which measures just under an inch across. The necklace adjusts from 16 ½" to 18" and will bring lovely summery color to your decollete.